As a woman writing about music, I tend to think - I like to think - that I am writing not just for my own self but my own sensibility. And what is that? More than a bit aimless; ready to listen to anything if it is good; appreciative that there are times when I don't want to listen to something that the (still overwhelmingly male) music-writing massive would call "important" or (ahem) "seminal." It is their loss, of course, and those who kept this at #1 in the UK for over a month were likely those who don't pay much attention to the music press in the first place*. 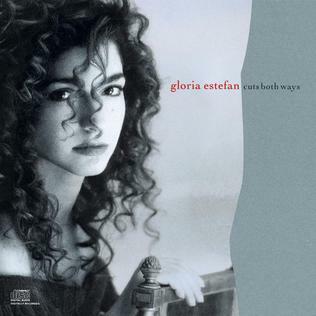 This is Estefan's first solo album, and she sounds more upbeat here than on Anything For You; it is as if her apprenticeship as one of Miami Sound Machine (woman-machine) is over and now here she is, a woman in her own right (though MSM are still there, more or less). "Ay, Ay, I" begins the album with the main theme - "I can't do without you" - and all the troubles that come from this irrefutable feeling. (This album is about feelings, and some boys - not men - have problems with feelings.) Musically it jumps along like Janet Jackson, and she sounds as determined to win back her Other, who she knows loves her, even though he sets her up, knocks her down. "Say" is about wanting to hear from the Other - oh, I've had this too Gloria - where you get all excited by the Other but when are you going to hear that declaration back? This is no mope, but an upbeat song (by the then-up-and-coming Jon Secada) that is like a cheerleader jumping around more than someone saying "please, please say something." That said, waiting for someone to say "I love you" is tough - "don't wanna worry, but is our love alive?" asks Estefan, then recovers from her doubt, as her - yes - feelings about her Other are so strong, in the end. "Nothin' New" sounds like go-go, a little Frankie in the chorus (hoo-HAH-hoo-hoo-HAH) and is a weird song about how difficult love is and there is nothing new under the sun and whatcha gonna do about it, kid. It is a "we" song - "life goes on no matter what you do" is the main thrust, and we are practically in Nein territory here. There is nothing to do but love, and it's not new and so what. You have to trust and do the best you can. "Your Love Is Bad For Me" brings us back to the torture of "Here We Are." The longing here is more explicit, and the badness is just part of her pleasure, in the end. "I'd love you till you could not take it any more" is followed by "Then you'd walk out the door." Estefan - or the narrator - is not messing around here. "You don't belong to me" is the thorn here, the moment when all this sleepless insanity and melodrama has its reveal, and it's done lightly, as if the badness - he's cheating! with her! - is the cause of her love, as much as the Other. (I can imagine whole Oprah programs about this, with guest psychologists and everything - I'm The Other Woman And I Feel Conflicted.) What on earth could Emilio, her husband, make of all this? Next up: look what Bunny wrote! * Not all of them, though. I'm sure the Pet Shop Boys bought this and loved it. Thanks for this. I absolutely loved this album at the time and recall playing it to death during the summer of 1990. I was 12 and she was my first real pop crush - I remember being infuriated & bewildered when Fuzzbox slagged her off in Smash Hits and asking my dad what ‘right wing’ meant. I haven’t heard it since, but I still have the glossy signed print of the cover she sent me after my dad wrote her a letter wishing her well after the accident. This piece and the entry on ‘Anything For You’ have made me curious about how I’d respond to her stuff now. I must revisit them. The only Estefan album I own is "Hold Me Thrill Me Kiss Me" (all remakes). I picked it up for $3 & it is a pleasant album. I always thought Estefan was a good radio artist. She made good pop music.